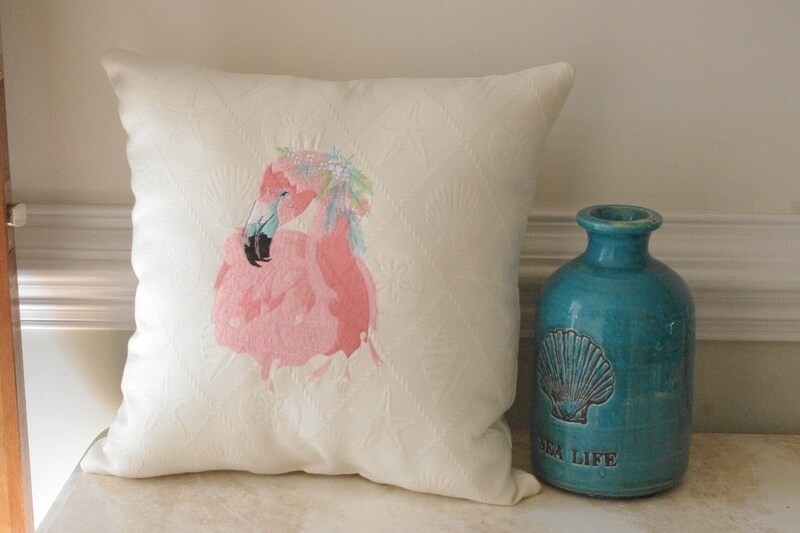 Love this new boho flamingo embroidered pillow. Perfect for your tropical home. Wouldn't this pillow look beautiful on your bed, in your guestroom, in your favorite chair or in your sunroom? This pillow was embroidered with the pink shades of a flamingo, aqua, lavender and lime green. There are lots of beautiful details in this embroidered pillow. The fabric was factory woven into a trellis pattern with starfish, seashells and sand dollars. I love this fabric. Subtle but also a statement maker. The pillow is filled with quality fiberfill. This same fabric is also on the back. However, the back is not embroidered.